"For beneath the façade of this beautiful resort destination beats the heart of a small town". This sums up the island of Nantucket. I've always wanted to go to Nantucket (I have a thing for islands) but only got as far as Martha's Vineyard. 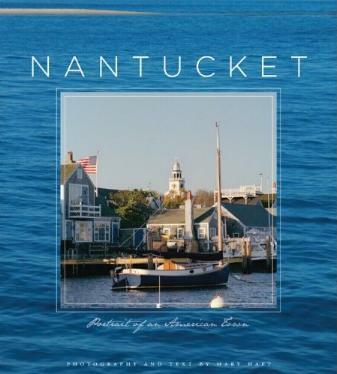 Like most places, Nantucket has its fair share of history and historical tales. It was the possibility of losing not only the history but the island itself to the "new economic reality" and the influx of new people, that author/photographer Mary Haft decided to write this book. Nantucket was inhabited by the Wampanoag tribe of Indians before the English arrived and used them in the whaling industry which made the island a major seaport. Haft talks of the early pioneers who influenced and/or lived on the island. Industry on the island includes the successful cultivation of cranberries scalloping, and lobstering. There is agriculture as well that yields vegetables. Crafts abound as well, like scrimshawing and basketmaking. Other industries such as beer brewing and vodka and whisky production also flourish. Tourism of course is huge and very important to the island, and it is therefore geared for the thousands who descend her shores every year. They come to eat the breads, the seafood, browse the bookstores, visit the museums, frolic in the sea, walk the beaches, and get to know the locals. A great book to read and absorb before your trip to the island, or to just enjoy the history and photos of this enchanting little place. Conclusion - Exquisite, and a must on everyone's coffee table!